TGIF. The end of the work week is just hours away. 1. 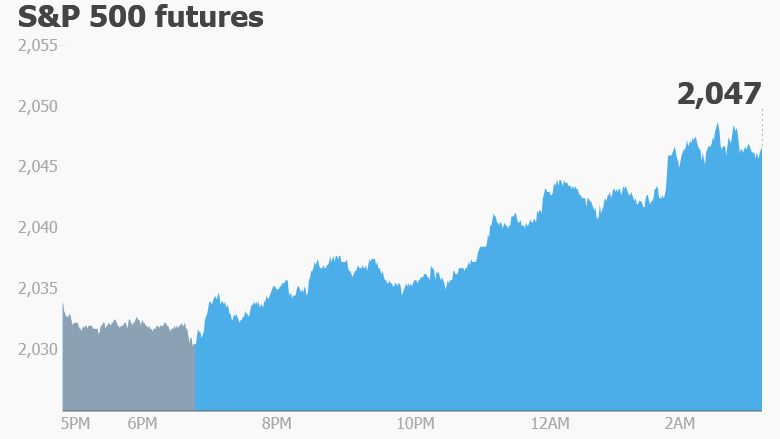 Let's bounce: U.S. stock futures are bouncing higher and European markets are rising in early trading. Italian banking stocks are staging a stand-out rally, which is lifting the FTSE MIB index by about 2%. Italian bank shares have been pushed down over the past few months over concerns about billions in bad debts. Asian markets ended the week with mixed results. Oil is up about 3% to trade around $38.50. 2. Thursday market recap: The Dow Jones industrial average experienced its worst loss in six weeks on Thursday, dropping by 174 points, or 1%. The S&P 500 fell 1.2%, turning negative for year. The Nasdaq declined by 1.5%. 3. Yen in focus: Traders are watching the Japanese yen as it gives back some the gains made in recent months. The yen has strengthened by 10% against the U.S. dollar this year, and is up 9% versus the euro over the same period. The currency's continued strength could prompt the country's central bank to increase its stimulus program. "On a trade-weighted basis, it has not been as strong since late 2013," explained specialist Asian economists at Capital Economics. "We think that the ongoing strength of the exchange rate has made it ever more likely that the Bank of Japan will announce more stimulus at the meeting later this month." 4. Stock to watch -- Yahoo: Ailing tech giant Yahoo (YHOO) continues to be "one to watch" following a Bloomberg report that Verizon (VZ) and Google (GOOG) are considering bids for the company. Both Verizon and Google declined to comment to CNNMoney.